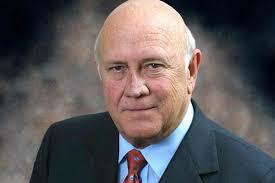 FW de Klerk (Frederik Willem de Klerk) is a South African politician and the former South African State president who served from 1989 to 1994 and was also the Deputy President from 1994 to 1996. He was born on the 18th of March 1936 in Johannesburg, South Africa. He was the 7th and the last head of the South Africa state under the apartheid era. He was born on the 18th of March 1936. He is 83 years old as of 2019. He got married to Marike Willemse in 1959 but they divorced in 1998. In 1998 he got married to his second wife Elita Georgiades. He has three children from his first marriage to Marike Willemse one daughter and two sons who are Susan de Klerk, Willem de Klerk, and Jan de Klerk. He has an estimated net worth of about $46 million making him stand amongst one of the richest politicians in South Africa. Executive Committee Member of Afrikaanse Studentebond at the University of Potchefstroom. Editor of the University of Potchefstroom Campus Newspaper. Vice-Chairman of the Students Representatives Council University of Potchefstroom.